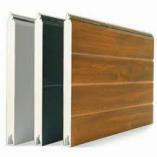 Constructed in 20 or 42mm thick insulated steel panels (generally speaking, in a standard 6 ft 6" or 7 ft high door there would be 4 panels) rising vertically from the floor and retracting overhead, these doors offer great thermal properties and can be installed between the apetuer or behind the apeture. 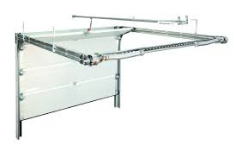 The mechanical mechanism for the sectional doors can be side sprung, rear sprung (as in the diagram), front sprung or a spring mechanism in an enclosed box situated at the top of the track. 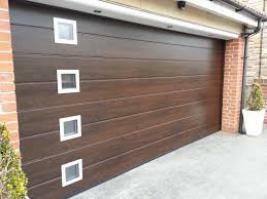 Sectional garage doors are one of the more popular door of choice due to the style, safety, security and ease of use, the panel is constructed with an overall thickness of 42mm, and a deep bottom rubber giving a good seal to the floor. This gives greater insulation properties. 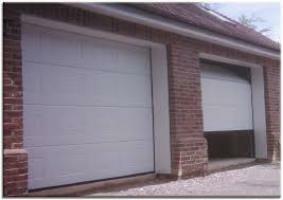 They are called sectional doors as they open and close in individual sections, or panels, operating vertically without any swing out from the structural opening.